Correctly guessing that most people use such credit card sized compacts for snaps of family and friends in the main, with the Digital IXUS 80 IS Canon has added to and enhanced old point-and-shoot favourites, with face detection white balance and automatic red eye correction added this time around, plus a face select and track function. To help you get sharper shots in lower light conditions without the need for flash, the Digital IXUS 80 IS features optical image stabilisation in the form of a lens-shift mechanism which physically corrects the light path. As part of a belt and braces approach, this is also newly backed up by motion detection technology that assesses camera or subject movement. The latter is effectively what rivals would refer to as digital anti shake, as, activated in high ISO auto mode, it boosts ISO to a level (between ISO80-800) it considers will compensate without hopefully introducing too much noise. Still, you do get both in the same camera. Retained from previous generations of digital IXUS models are the fun but largely extraneous 'My Colors' range of in camera photo effects, plus long play or timelapse movie clip options, while Canon has added a sunset mode to its scene options (accessed via a combination of the function set and display buttons), plus an image trimming option to save having to use the crop function in Photoshop later. Furthermore, Canon claims AF performance in low light has been significantly improved to achieve focus in scenes at around one stop darker, so users can now take shots in conditions where they would have been unobtainable before. Unsurprisingly, given the Digital IXUS 80 IS' compact measurements, the range of the supplied 3x zoom (38-114mm equivalent in 35mm terms) is distinctly average, as are the dimensions of the rear 2.5-inch LCD (look to the IXUS 90 IS for a 3-inch screen), though the resolution is a more impressive 230k pixels. This ensures clarity is sufficient to determine correct focus and exposure, both indoors and out. The camera itself is as well built as you'd expect an IXUS to be. It's an attractively weighty mix of aluminium and plastic, yet sufficiently lightweight to ensure it slots unobtrusively in a top pocket, its build perhaps justifying the extra �20 over its 8 megapixel rivals (at a UK SRP of �219 in total). Unusually these days a memory card is provided out of the box to get you started. This is a welcome addition given the beginner market at which this camera is targeted, even if it's a slightly stingy 32MB capacity standard SD card. Unfortunately the full manual is only included on CD ROM, with a heavily abbreviated quick start guide the only hard copy provided. 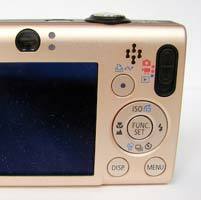 The design of front of the Digital IXUS 80 IS features a slight undulation to its faceplate that Canon refers to as a 'perpetual curve'. While that's so much waffle, in practical terms this is somewhere for your middle finger to find purchase when gripping the camera, its otherwise completely smooth surface proving slippery to the touch. The lens barrel, stored flush to the body when not in use, features a mirrored circular surround which is certainly eye catching, with a window for the internal flash situated top right of the lens, another window for the optical viewfinder directly above, plus an AF assist/self timer indicator alongside a pin-prick sized hole for the built-in microphone. It's still a surprise to find a camera this diminutive bothering to include an optical viewfinder, something the Digital IXUS 80 IS' big brother in the IXUS 90 IS does away with entirely. With your eye pressed up against it, it's unsurprisingly small, its clarity cloudy, and easy to overlook � in fact I'd go so far as to call the inclusion of an OVF pointless at this level. The top of the credit-card sized Digital IXUS 80 IS features a recessed on/off power button with adjacent cool green indicator light lit when in use, next to which sits the raised and larger shutter release button. The IXUS 80 is up and running in just over a second, the lens rapidly extending to maximum wideangle setting while the rear screen bursts into life. It's similarly lightning fast to determine focus and any shutter delay is imperceptible, while high resolution JPEGS are committed to memory in an instant, the rear screen blanking out momentarily as it does so. Maximizing the available space with the minimum of controls, the shutter release button is surrounded by the zoom lever which requires fingernail operation and precision to operate, meaning that unless you're zooming fully in or out with one smooth action, determining your framing is a slightly jerky process, sound-tracked by the whirr and buzz of its internal mechanics. In playback the zoom can be used to check focus when steered towards its telephoto setting, or alternately display captured images as a sequence of thumbnails if directed to maximum wideangle. 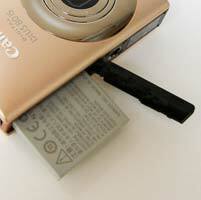 The rear of the Digital IXUS 80 IS maintains the minimalist design approach, with controls situated flush to the body. Unsurprisingly dominated by the aforementioned LCD, sitting beneath that tiny optical viewfinder, the main function adjusters are situated on the right hand side.� These comprise an indented and plastic construction slider with a raised ridge that just catches the thumb, and three settings for alternating between still image capture, movie capture and playback. All three are illustrated with self-explanatory icons, so nothing here to confuse the beginner. Next to this are four monkey nut shaped holes, indicating the built in speaker, beneath which is a button for adding selected shots to a print list with a single button press should you wish to hook the Digital IXUS 80 IS up to one of Canon's Pictbridge-enabled Selphy printers. Press that function set button at the centre of the control pad and the familiar Canon L-shaped tool bar pops up on screen. The array of options across the bottom includes the ability to tab between full auto and manual capture, alongside the additions of digital macro, portrait mode, night snapshot, colour accent (as it sounds, spotlighting a particular colour in an image to the detriment of the others), colour swap and, indicating a possible family audience of doting mums, one specifically for flighty kids and pets. Whichever of these options you choose then appears top left of screen, situated on the vertical axis of the toolbar. If you're shooting completely in auto mode, the other options on the vertical strip are disabled apart from the ability to select image size and JPEG compression level. However, if you've chosen manual mode, there's additionally the chance to adjust exposure compensation (+/- 2EV), white balance, select from the range of My Colors image editing/enhancement options (including the ability to lighten or darken skin tones), plus switch between evaluative, centre weighted or spot metering. As a default, your chosen settings are displayed around the edges of the screen when it is used as an electronic viewfinder, but a single press of the display button turns these off for a clearer view, while a further press deactivates the screen entirely. 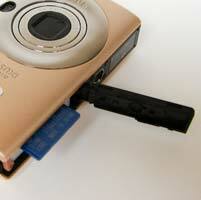 The last button on the Digital IXUS 80 IS's back is for 'menu'. Pressing this brings up a set of three folders on screen; one governing additional shooting settings, the other providing fairly generic set up options and the latter letting you customise the camera's screens and sounds. Among the more common settings, the shooting options let you bias the AF frame toward face detection (which appears also to be its default setting), switch on the point AF function which zeroes in on a face before you press the shutter button fully, and choose from a range of image stablisation modes; from continuous to shoot only to panning to off. All of the above is pretty much what you'd expect to find on an entry-level camera toward the higher end of the price scale for its class. And, apart from some of the controls requiring fingertip precision to operate, there are very few grumbles here. Use is intuitive, the Canon Digital IXUS 80 IS is fast to respond, and arguably that's all any of us really want from a pocket-sized point and shoot. Apart from razor sharp, colour and detail-rich images that is. 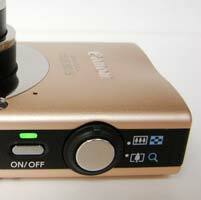 So can the Digital IXUS 80 IS also come up trumps when it comes to that part of the equation? PhotographyBLOG is a member of the DIWA organisation. Our test results for the Canon Digital IXUS 80 IS have been submitted to DIWA for comparison with test results for different samples of the same camera model supplied by other DIWA member sites.